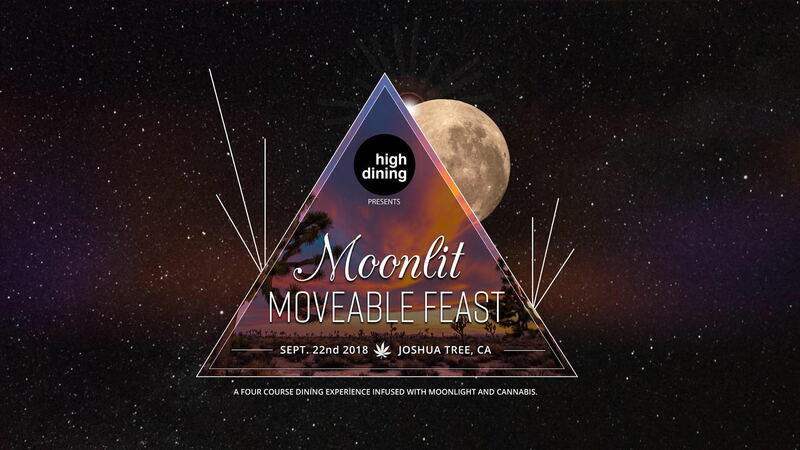 The North African desert meets The Mojave this fall when High Dining presents its fourth Moonlit Moveable Feast on Saturday, September 22, 2018. Enter an exotic world of enchantment, education and epicurean delight. Recently returned from Marrakesh, Chef Sabrina Eustis is preparing a menu starring four luxurious Moroccan-inspired courses of cannabis-infused haute cuisine during this intimate dinner party adventure. Moonlit Moveable Feast takes place, first of all, only on a full moon, outdoors in the legendary pastel colored deserts of Joshua Tree California. Meticulously art directed in every detail, the Feast indulges all your senses from the moment you arrive - live glass blowing, performers, artists, installations and musicians, all in a venue famous for its lavish eclecticism. Flower Pairing: Aloha Humboldt Cannabis Strain Blueberry Cookies. Kyle Simon leads guests in an audible dialogue with the Moon with, "The Sirens". The Dank Duchess guides guests in a chillum ceremony and an education on the almost lost art of hashishin. Enter the Faerie Jane Oasis and be dazzled by "Faerie Jane by Strain" gold-plated, diamond-studded cannabis leaf fine jewelry and sacred tobacco and herbal blends. Dr. Jeffrey Raber of The Werc Shop, a world-renowned cannabis chemist known for his ground breaking work on terpenes. Keiko Beatie of Greenwave Relations is Hostess for the evening. The Herb Somm guides us through an education on wine and weed pairings, terpenes and a new level of connoisseurship. Brian Applegarth of Emerald Country Cannabis Tours, shares his passion about California cannabis history and culture. Ashley Asatu, creator of the Yogasm Experience and the Yoni Day Spa shares how intentional use of plant-based herbal medicines aid in the healing process. Tom O'Key, of the Joshua Tree Astronomy Arts Theatre, our favorite desert skywatcher enlightens us on heavenly bodies. MC Flow, a.k.a. Her Highness shares how cannabis is a catalyst for creativity. What is the experience like? Read all about it on MassRoots, GreenState and more. We micro dose approximately 10mg of ingestible THC throughout the evening, with some infusions being optional and non-psychotropic. For those with higher tolerances, we've got you covered with smokable and vaporizable options. Have you joined the HIGH DINING CLUB yet? Club members receive premium gift bags, newsletters, recipes from our chefs and advance notice of future experiences.